Sensitive Joints from the Eukanuba Daily Care range is formulated to help healthy joints with added Glucosamine and Chondroitin Sulphate, and also L-Carnitine for a healthy weight to reduce stress on the joints. 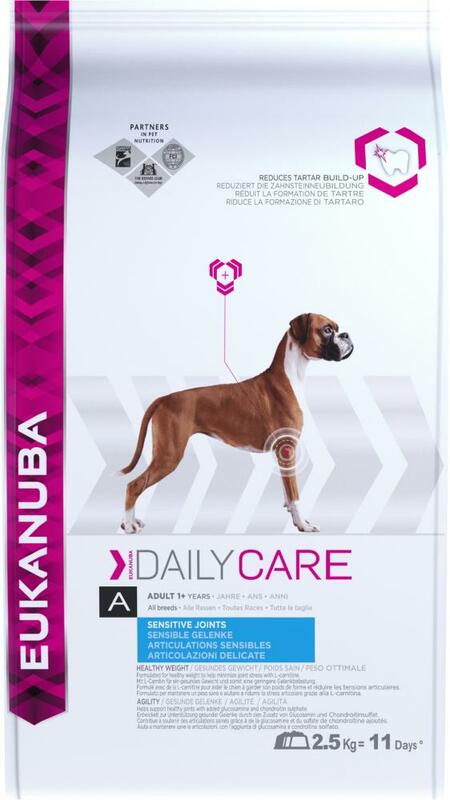 Eukanuba Daily Care Sensitive Joints is specially beneficial for adult dogs with a predisposition to stiff joints. Recommended For: Adult dogs with sensitive joints (1+ years). Dried Chicken And Turkey (22%), Maize, Wheat, Sorghum, Animal Fat, Barley, Dried Beet Pulp (3.8%), Dried Whole Egg, Hydrolysed Animal Proteins, Potassium Chloride, Fish Oil, Calcium Carbonate, Sodium Chloride, Linseed, Sodium Hexametaphosphate, Fructooligosaccharides (0.38%), Glucosamine (576mg/Kg), Chondroitin Sulphate (57mg/Kg). Vitamin A (45419 Iu/Kg), Vitamin D3 (1507 Iu/Kg), Vitamin E (252 Mg/Kg), L-Carnitine (48.1 Mg/Kg), Beta-Carotene (28.4 Mg/Kg). Contain Basic Cobaltous Carbonate Monohydrate (0.49 Mg/Kg), Cupric Sulphate Pentahydrate (47 Mg/Kg), Potassium Iodide (3.4 Mg/Kg), Ferrous Sulphate Monohydrate (623 Mg/Kg), Manganous Sulphate Monohydrate (47 Mg/Kg), Manganous Oxide (34 Mg/Kg), Zinc Oxide (216 Mg/Kg). There are currently no questions for Eukanuba Adult Daily Care Sensitive Joints Dog Food - be the first to ask one!